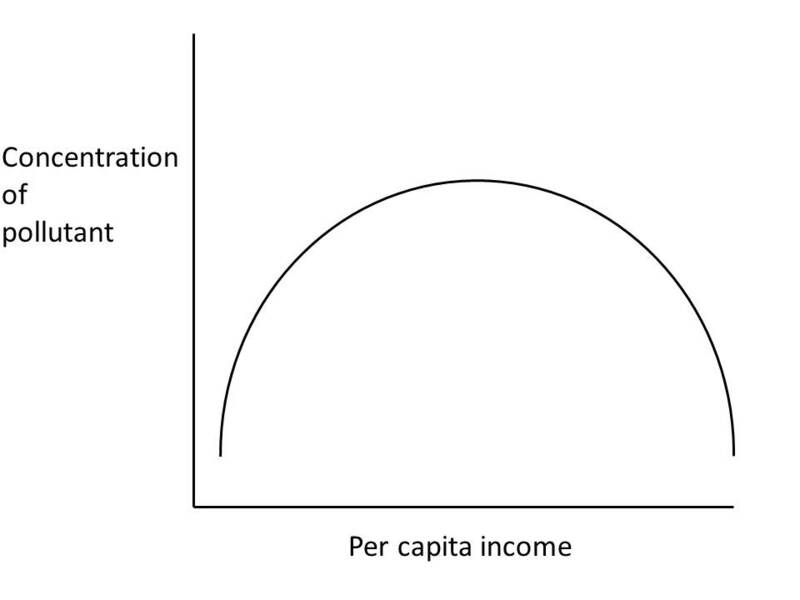 If true, the Kuznets curve allows us to reduce both poverty and pollution. Unfortunately, evidence for the Kuznets curve is limited and inconsistent. It actually works fairly well for certain pollutants, like sulfur dioxide. Relatively poor nations lack the technology to produce sulfur dioxide in the first place, and relatively wealthy nations can afford to utilize alternative technologies that don’t produce as much sulfur dioxide (a known threat to public health). The Kuznets curve breaks down when you analyze other pollutants, particularly those associated with consumption, like household trash or CO2 emissions. For these pollutants, poorer countries produce less, and the wealthier a country is, the more they produce. It is certainly possible that if per capita income increases enough, we will start to see reductions in household waste and CO2 emissions, but it isn’t really feasible to assume that every nation in the world will see per capita income that’s drastically higher than what the richest countries currently enjoy. While there is some evidence supporting the Kuznets curve for certain pollutants, making everyone richer does not seem to be a silver bullet for pollution reduction. In fact, increased per capita income may even increase certain environmental problems associated with consumption, such as climate change. Reducing poverty and protecting the environment by reducing pollution are both worthy goals, but fixing one won’t necessarily fix the other. Saving the world, as it turns out, is complicated. Litter can be called a pollutant, but not trash. If we just dumped our trash in the street, you might have a case. We don’t. We dispose of it in a way that doesn’t cause disease and health problems or even aesthetic problems. CO2 is not a pollutant. It’s a naturally occurring gas necessary for plant life – that’s like calling a flood pollution from too much water.